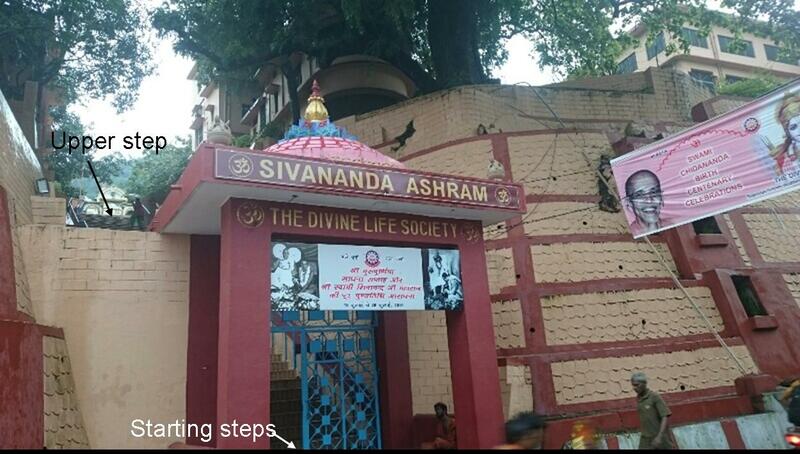 'Bliss Divine' by Shri Shivananda influenced us to a great extent when we read it in the early 80s. For our visit to Rishikesh in August 2016, we booked our room in the Shivananda ashram. I was looking forward to imbibing all the positive energy from the ashram. We knew that Swami Shivananda had stayed here and Neem Karoli baba used to visit some times. The auto driver was in no mood, 'You just get down and search.' My husband told him sternly that he will just go across the road to the office and find out. He came back after ten minutes and since it was the correct location, we got down in front of the ashram. There were about fifty steps to climb. He told that he would first go and see the room and then we all could go. My daughter and I were standing below those fifty steps, there was a small shelter, but the water was flowing down the steps and coming toward the luggage, it was a tough job to not get them too wet. We stood there for about 40 minutes. Many people, some of them in saffron and white clothes passed by, nobody asked us whether we needed any help. Three men and a boy of about 12 years, and another person in saffron dress came to the area where we were standing, to escape the rain. The saffron clad man started smoking cigarette, standing close to the boy. Meanwhile my husband came down and told that the bed sheets in the room were not so clean and the geyser was not working. We decided to search some other place to stay and returned the key of the room. Again he went out to search and in ten minutes came back with a hotel boy who took our luggage and we walked down to the hotel, 'Ganga blossom'. The staff was helpful and when we came into the room, we forgot all the difficulties encountered so far. The room had a huge window, overlooking the Ganges. Oh! What a refreshing sight! We could just sit on our bed, look at the Ganges and meditate. The Ganges wanted us close to her, that's why our staying in the Shivananda ashram did not work out. Thank you Ganga Ma!